The most significant threat of a winter storm for many across the Midwest is coming to fruition in the West and is poised to slide east through the day tomorrow. Computer models are coming together in agreement with the track and banding features expected to fall northwest of the low pressure system. A long yet narrow swath of 6"+ is expected to pile up, with an even more narrow band of 10"+. An isolated total of 15"+ is certainly possible, but too early to pin exactly where this may occur. Some indications suggest northeastern Nebraska has a good chance to see 15" with increased cold air and higher liquid to snow ratios expected here. Furthermore, anywhere along the narrow red strip may see a couple isolated totals in excess of 15", depending on where banding feature tend to stall out and pivot. 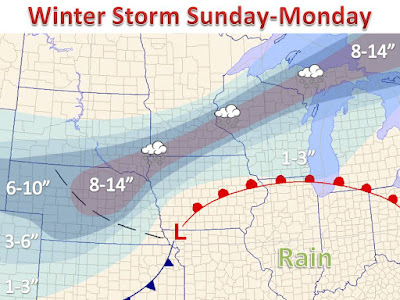 The heaviest snow is expected to fall during the day on Monday. While, widespread blizzard conditions are not expected, gusty winds and blowing/drifting of snow will also occur due to the deepening area of low pressure. Now, with any weather forecast there is some inherent error in the exact track. Located below is a chart of 20+ model runs and what they suggest for snow totals in Minneapolis (left) and Green Bay (right). Still some spread, but overall not to bad for still being 36+ hours out. Based on the best science, the trends and snow ratios, the forecast above was reached. As always you can get further updates on Twitter and Facebook or find links on the right hand side of the page. Enjoy the snow, if you want it, and stay safe either way. If you care to check out some of the weather model snow outputs Click Here!